Slips, trips, and falls are often the most common causes of injuries and occupational fatalities. Competent Person - Trenching And Shoring - It occurs year after year, workers needlessly dying in trench cave-ins. The tragedy lies with the fact that these workers should have never have been in a situation in which their lives were on the line. Based on National Institute for Occupational Safety and Health statistics, an average of 60 workers die in cave-ins annually. According to NIOSH, these deaths are entirely preventable. This training program has been developed specifically for those persons actually working in or around trenches, excavations. An excellent refresher course for anyone in this category. Basic information stresses trenching safety, equipment, different types of soils, The competent person job responsibilities. Discusses pre-planning, how heavy soil is, cave-ins and other day to day risks and hazards. 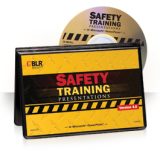 This workplace safety training video program helps you reduce the risk of excavation-site accidents with this powerful training tool. 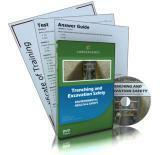 This program provides basic information on safety procedures when trenching and shoring. Emphasis is placed on environment conditions and safety of workers. Skid steer equipment has become the number one workhorse for public works and construction. With attachments such as trenchers, plows, grapples, buckets and hoes, hydraulic breakers and sweepers, and more, their versatility is limitless. The best part of a skid steer is that they are exciting to operate. This course covers safe work practices for excavation and trenching work. It is meant to be used as an introductory or refresher course for construction workers involved in digging or working in an excavation. It is based on OSHA Construction regulations and industry best practices. This course covers the importance of soil properties and classifications when engaging in excavation work. It is meant to be used as an introductory or refresher course for construction workers who will be digging or working in excavations. It is based on OSHA excavation regulations and on recognized best practices. Backhoes are one of the most common types of construction equipment found today and rightly so, as their versatility and maneuverability makes the backhoe the equipment of choice for most construction jobs. This course provides information on struck-by hazards, including vehicles and cranes, falling or flying objects, and masonry walls. It also includes information on these caught-in and caught-between hazards: trenching, unguarded machinery, and equipment. This program covers what happens if you do not call before digging, acquiring locations, mark-outs, and what to do in case of an emergency. Our new EHS Plus Combo-Pack is our most comprehensive DVD set yet. With 56 individual DVDs, this set will keep your team engaged with over 25 hours of self-paced training content.